At the time of writing, we’re 50 weeks into 2017, and I can honestly say that what happened in week 48 will safely go down as one of the most memorable of the year. What made it so special? Well, it was a week like many others. We engaged with our clients and helped solve their challenges. We brainstormed new concepts and campaigns. We managed multiple production meetings, and we completed a raft of strategic projects. Yet despite the apparent productivity of week 48, these elements alone aren’t what earned my attention. It was the addition of two young and aspiring guys by the name of Yarran and Brandon who came to join us for a week’s work experience that made it a week to remember. Yarran and Brandon are from a small Indigenous community about an hour and a half outside of Sydney, where life for them is less clear, less structured and very much in need of support and guidance. Our opportunity to meet them came about through our recent collaboration with the GO Foundation; an initiative established by Adam Goodes and Michael O’Loughlin in 2009 to create opportunities for Indigenous youth through education, networking, scholarships and support. The purpose of the foundation hinges around what’s called the ‘GO Ecosystem’, that through collaboration and team work, young Indigenous Australian’s will be empowered to change their own lives for the better. Beyond the opportunity to support the foundation, the motivation for our collaboration comes from a deeper desire to contribute to ongoing positive change in our industry. In Australia, we’re blessed to have a wide range of elite sports to consume as fans, participate in as amateur athletes or aspire to as professions, and it’s these sports which are a proving ground for many young Indigenous Australian’s. In fact, 4 of the past 8 “Indigenous Australian of the Year” winners, have been sportspeople. The issue however, is less so what takes place on the field, and more about what doesn’t take place off it… While there is a reasonable representation of Indigenous Australian’s in on-field aspects, there is a significant lack in the realms of governance, coaching or administration components. Here in sits our hope, that by getting behind the GO Foundation and offering ongoing work experience placements, we’ll get more Indigenous Australian’s being exposed to the wider aspects of the sporting landscape. Over the longer term, the broader the diversity in sport and entertainment, the better. Week 48 will now be known as the week we laid the first brick in our bridge between the field and the boardrooms of sporting institutions around Australia. In the space of one short week, Yarran and Brandon were exposed to client meetings, creative brainstorms, presentations, shoots with Socceroos and a culinary session with Neil Perry. A standard week for our team, that turned into an eye-opening week one for us all. 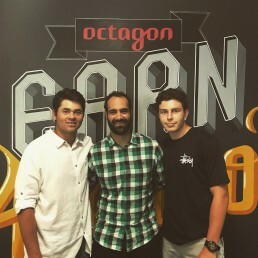 While Yarran and Brandon head back to their studies, we sit, eagerly awaiting the next opportunity to welcome more future stars from the Indigenous community into the Octagon family; if only for a week. This article first appeared in Octagon News on 18 December 2017.